11/24/2013 - Romania revokes the Knight's Order of the "Star of Romania" from hero of the Romanian Revolution, Bishop László Tőkés. AHF writes to the US Helsinki Commission on this latest anti-Hungarian measure: "The Federation respectfully and strongly urges you to publicly on behalf of the Helsinki Commission raise Romania’s most recent anti-Hungarian phenomenon – the revocation of the Medal Star of Romania previously awarded Bishop Laszlo Tokes for his extraordinarily courageous role in toppling the Ceaucescu dictatorship during the 1989 revolution. And what was Bishop Tokes’s transgression resulting in the revocation? Exercising his constitutional rights by standing up for the interests of the Hungarian minority in Romania. The revocation should be reversed." The revocation comes years of a coordinated smear campaign against him. [download] AHF's letter to the US Helsinki Commission regarding the withdrawal of the "Star of Romania" from Laszlo Tokes. The American Hungarian Federation (Federation), founded in 1906 as an umbrella organization, is an independent, non-partisan entity representing a broad cross-section of the Hungarian American community. From its founding, the Federation has supported liberal democracy, human and minority rights, including the rights of the Hungarian minority in Romania,* and the rule of law in Central and Eastern Europe. The Federation respectfully and strongly urges you to publicly on behalf of the Helsinki Commission raise Romania’s most recent human rights violation and anti-Hungarian phenomenon – the revocation of the Medal Star of Romania previously awarded to Bishop Laszlo Tokes for his extraordinarily courageous role in toppling the Ceausescu dictatorship during the 1989 revolution. And what was Bishop Tokes’ transgression resulting in the revocation – exercising his constitutional rights by standing up for the rights of the Hungarian minority in Romania. The revocation should be reversed. The canary is suffocating in Romania. We, therefore, urge you to also publicly call on Romania to respect and live up to fundamental human rights, including the freedom of expression. The Helsinki Commission needs to be heard; violations of fundamental human rights, anti-minority policies and practices, intolerance and undemocratic measures cannot be tolerated. Silence, we fear, would be misinterpreted by some, as unjustified as that would be, as acquiescence and result in further violations of the very principles the Helsinki Commission is charged to advance. *The Federation has turned to the Helsinki Commission on several occasions to express its deep concern over a raft of human rights violations and anti-minority practices and policies, including but not limited to Romania unjustifiably prosecuting former state secretary Attila Marko, Silviu Vlim and Tamas Marosan in connection with the restitution to the Reformed Diocese of Transylvania of the Szekely Miko Evangelical Reformed College in Sfantu-Gheorghe; failing to restitute church, religious and communal properties confiscated by the previous Communist regime; rather than grant its Hungarian minority limited autonomy rights, proposing instead to redistrict administrative units that would further reduce the ability of Hungarians to effectively participate in public affairs, especially in matters affecting them and to enjoy their culture; and refusing to restore the independent Hungarian university in Cluj-Napoca/Kolozsvar. “… I ask Prime Minister Viktor Orbán, and his government, to continue developing the Program of National Cooperation. I also ask that they (i.e., the Government of Hungary) exercise a protective function vis-à-vis the ethnic Hungarian minorities beyond the borders of Hungary, including Transylvania, similarly to Austria in the case of South Tyrol. On the 8th of February on the Antena 3 TV channel’s „On the Agenda” program Radu Tudor political analyst said that László Tőkés is the biggest anti-Romanian persona alive, while Dana Grecu anchor did not rebuke the journalist thus she transgressed the provisions of the Audiovisual Act. László Tőkés and Monica Macovei (PD-L) are financed from abroad by those whose interest lies in Romania’s instability and who would like to see Romania attacked from all sides. He added that László Tőkés utilises a Hortyist discourse and that together with Monica Macovei for years they have been the representatives of anti-Romanian interests. He made this declaration with reference to the statement made by the president of the Hungarian National Council of Transylvania with reference to Romania’s division into regions: „Nicolae Ceauşescu was more generous than Victor Ponta, as he made a certain kind of autonomy possible for the Hungarians, while the prime minister refuses the idea of establishing a separate region of Szeklerland.” László Tőkés also stated that Ponta was a follower of the retrograde communist heritage. Prime minister Victor Ponta (PSD): László Tőkés EP-member’s declarations with reference to Transylvania are not only insulting, but belong in the category of criminal statements. According to the communiqué of the Ministry of Foreign Affairs, László Tőkés’s concepts are irredentist and are rooted in the period between the two World Wars. According to Radu Podgoreanu, secretary of the Ministry of Foreign Affairs, László Tőkés’s statements made at Tusnad point to the fact that it is inadmissible for a political event organised in Romania to spread revisionist ideas that question the territorial unity and suveranity of the country. In Realitatea TV’s „Jocuri de putere” („Power Games”) evening program Nicolae Ulieru, former spokesman of the Romanian Intelligence Service (SRI) declared that in 1990 he saw László Tőkés’s informant files according to which the former bishop was the informer of both the Romanian and the Hungarian secret services. With reference to the statements made by László Tőkés EP-member, president Traian Băsescu said that: „(László Tőkés) does not deserve to be a citizen of Romania.” He added that „most probably” it should be examined whether a Romanian citizen is allowed to behave like this. 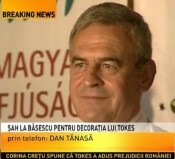 Crin Antonescu, president of PNL, asked president Traian Băsescu to withdraw from László Tőkés the award „Romania’s Star”. In Realitatea TV’s "Jocuri de Putere" („Power Games”) program Cozmin Guşă political analyst said that László Tőkés was only a tool, his reputation existed because of the political interests of a few people who still needed him. Răzvan Dumitrescu editor presented a document that he called sensational (a fake bond that has been referred to by the Romanian media numerous times) that was published in the Tinarama magazine already in 1992 by Ioan Itu, and according to which László Tőkés was the informant of the Securitate. Ioan Itu added: He enjoyed the support of another collaborator of the Securitate, someone who now is the head of the state. Realitatea.net published László Tőkés’s so called commitment to the Securitate signed on the 19th November 1982. In Antena 3 TV’s „Subiectiv” („Subjective”) program Ioan Talpeş, former director of the Foreign Intelligence Agency (SIE) stated that László Tőkés had been the agent of the Hungarian intelligence service. Journalist Răzvan Dumitrescu presented again the so called commitment of László Tőkés to the Securitate. Prime minister Victor Ponta, the president of PSD asks president Traian Băsescu, to withdraw László Tőkés „Romania’s Star” award. Corina Creţu EP-member (PSD) asked Martin Schulz president of the EP to punish László Tőkés. Corina Cretu EP-member (PSD), member of the Romania’s Star Order, asks for the withdrawal of László Tőkés’s award, addressing a letter to members of the Order in this sense. Her letter refers to László Tőkés’s shameful declarations that contradict the 1st Paragraph of Romania’s Constitution. 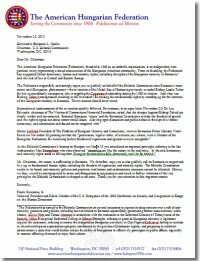 She also addressed a letter to the Court of Honour of the Romania’s Star Order. Leading politicians of PSD and UNPR, owners of the Romania’s Star award, joining Corina Creţu’s suggestion, ask for the withdrawal of László Tőkés’s award, Victor Ponta, president of PSD announced. Those who joined: Ilie Sârbu, Dan Nica, Ioan Rus, Ecaterina Andronescu, Alexandru Athanasiu, Ioan Mircea Paşcu, Gabriela Firea, Miron Mitrea, Şerban Valeca, Eugen Bejinariu, Gabriel Oprea, Marian Sârbu and Şerban Mihăilescu. At a press conference President Traian Basesecu stated that seven knights of the Romania’s Star Order had asked for the withdrawal of László Tőkés’s award mentioning that the final decision would be taken by the Court of Honour following its constitution on the 19th of September. The president also stated that following the nomination of the 7 members of the Court of Honour, the Court would be notified about the petition with reference to the withdrawal of László Tőkés’s award. Hungary honours former Timosoara priest Laszlo Tokes and Romanian human rights writer, Gabriel Andreescu, for their bravery during the 1989 Romanian Revolution. A young ethnic Hungarian priest, Laszlo Tokes, whose brave stand against the repressive Ceausescu regime sparked the Romanian revolution twenty years ago, received an award in the Hungarian capital, Budapest on Thursday (December 17). Reformist priest Tokes had raised his voice from the mid-1980s against the destruction of villages, many of them ethnic Hungarian in Transylvania. For his critical statements he was harassed and suspended. In December the Romanian secret police, the Securitate threatened to deport him but his ethnic Hungarian congregation and many Romanian sympathizers formed a live chain around his church office for several days, then took to the main square to protest. The demonstration against the deportation order was violently put down by government security forces. As the number of people swelled into mass protests, security forces opened fire on demonstrators, some having sought refuge in the city's cathedral. Nearly 100 Timisoara citizens were killed and hundreds more wounded as the city stood alone to defy Ceausescu's forces for five desperate days, before the revolt blazed a trail to Bucharest and the rest of the country. Speaking in Budapest on Thursday, the director of Hungary's House of Terror Museum, Maria Schmidt, said Tokes and his supporters had shown no fear. "With their resilience, bravery, well-organised resistance, faith and many examples of civic courage, Laszlo Tokes and his supporters proved that they were not afraid. It was not them anymore who were afraid. And they did not back down because they understood that led by their priest they would be able to tear down the walls of fear and if they did that they would become free at last," she said. Tokes received the Petofi award created jointly by the House of Terror Museum and the Hungarian oil and gas company MOL. The award is named after the Hungarian poet and freedom fighter, Sandor Petofi, who fought in the 1848/49 struggle for independence. The honour includes a large statue and 10,000 euros, which is given in recognition to those who fought for the freedom of the peoples of Central Europe. Together with Tokes, a Romanian human rights writer, Gabriel Andreescu also received the award. In the 1980's he published critical articles in the western press about the Ceausescu regime. In 1989 he went on a hunger strike for which he was arrested. "The love of justice and the love of freedom - this is our heritage," Tokes said at the ceremony. "The message of Timisoara that rid itself free of the forced silence is the same. And this message is carried on by Gabriel Andreescu with his gentle voice, with the force of the spoken true word, and with unbroken resilience," he added. Andreescu honoured Tokes in his own acceptance speech. "It's important to understand what he is saying, people need to have dignity in special moments. Tokes is a man of justice, not because he is right in everything that is never possible, but because he brings the essence of justice alive," he said. Earlier the week, President Traian Basescu awarded the Star of Romania national order, in rank of Knight, to Tokes in recognition of his achievements. ...on the 25th anniversary of the church protest against the demolition of villages: "What have I done to deserve to become the scapegoat for almost all the agents of Romanian politics as the target of the nationalist-postcommunist media, and all this to peak in the fact that „thanks” to the intervention of Victor Ponta social-democrat party president and Corina Creţu socialist EP-member and the comrades joining her official proceedings for the withdrawal of my state award have started?!" [download] and read more. "We, Members of the European Parliament, have learned with great concern that Romanian politicians have recently requested the withdrawal of the Order of the Star of Romania awarded to MEP Laszlo Tokes. We believe that such a move would contradict the values of freedom and democracy that Mr. Tokes was deservedly awarded the order for." "Romania, as a member of both the Council of Europe and the European Union, has obligations clearly stated in the Statute and the Treaties and the European Convention on Human Rights. The persecution, legal or other, of a citizen, any citizen, even a Member of the European Parliament, for exercising his/her freedom of expression and opinion, is never acceptable." - Göran Lindblad President of The Platform of European Memory and Conscience, Former MP [download] and read more. Statement by the Hungarian Ministry of Foreign Affairs on the revocation of the Star of Romania state decoration László Tőkés: "We acknowledge Romania’s sovereign right to decide who to award state decorations to, as well as its right to decide who to revoke it from. The revocation of the Star of Romania from László Tőkés nonetheless raises concerns. The hero of the Romanian revolution, respected European politician, and iconic figure of Transylvania’s Hungarian community is being stripped of his decoration based on a deliberate misinterpretation of his political beliefs. [download] and read more. Kiáll majd a Helsinki Bizottság Tőkés mellett? George W. Bush praises Basescu as a "special friend" and "special leader." "Rumania is a 'special ally' because Rumania shares the same values we do: human rights, human dignity, rule of law, transparency in government, anti-corruption." AHF knows the situation is far from Bush's rosy picture, but hopes Mr. Bush's encouraging words bring change to Rumania. 6/1/2005 - AHF Applauds US Congress and urges the community to thanks the co-sponsors of House Resolution 191...The United States House of Representatives recently passed H. Res. 191 on May 23, urging the "Government of Romania to recognize its responsibilities to provide equitable, prompt and fair restitution to all religious communities for property confiscated by the former Communist government."